Ruh Roh. 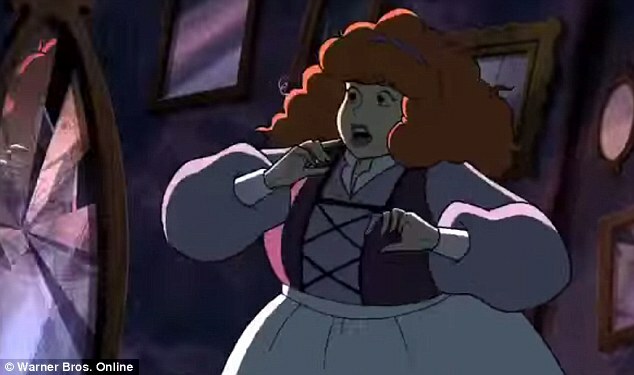 There's a horrifying monster terrifying kids in the latest Scooby Doo movie: a fat Daphne. In Scooby Doo! Frankencreepy, the newest movie just released, each member of the gang gets cursed. And Daphne, the supermodel-thin "pretty one" goes from a size 2 to a size 8. She doesn't grow fangs, or tentacles, or get warts in weird places. Her skin doesn't ooze or change colour. Nope. In order to make her transform into the most horrifying thing she can imagine, Warner Brothers made her fat. Size 8. Should I even bother to point out that the average woman is a size 12 these days? Or that those of us who are truly overweight are fighting like hell to ever SEE a size 8? Or that their version of Daphne going up 4 sizes actually makes her look like a size 26? Setting aside the fact that the animators clearly have no concept of sizes, what seems to be the most problematic is Daphne's reaction to her change. She looks in the mirror and recoils in horror. Full disclaimer: I haven't seen the movie. It was just released this week. But, in case you think "what's the big deal, it's just a direct-to-DVD kids' release" I can tell you what I know about Scooby Doo movies. They're popular. Insanely so. We are routinely pulling them for our holds list at the library, including from our holiday collection. Kids and parents don't care if they're watching a Christmas or Easter or Hallowe'en-specific version if it's the only one available. We have a lot of copies and versions and still people are hard-pressed to find a Scooby Doo on the shelf when they come in to the library, because they circulate so much. Of the 9 copies of Frankencreepy that the library has, 7 are currently out or on hold. The paperback book version of the movie is on order. It's popular. It's going to be seen. It's going to be seen by both little girls and little boys. For the girls, it will reinforce that getting fat is just about the worst thing that can happen to you. For the boys, it will reinforce that fat girls are monsters, and that if your worst fear is to become ugly, then it means you'll be fat. Are there really no other ways in which someone could be ugly? Is fat always going to be equated with ugliness? I was alerted to this specific example of fat shaming via the Dances With Fat blog post, Scooby Dooby Don't. She does a great breakdown of the various issues. An even better analysis is at The Good Men Project. They both point out the problems with the movie itself, and Warner Brothers' response to public outrage. (Outrage which hasn't been overly loud, but it's there in Amazon reviews, and IMDB. People noticed right away, enough that they had to issue a statement). "Another great lesson girls, if you want to know if you’re ok – ask a boy. You should always judge yourself by whether or not boys think you’re attractive. If the way you look changes substantially – even instantaneously – you should not be creeped out if that boy says that he didn’t notice. All that matters is if he thinks you’re pretty. (Boys, girls should base their self-worth on what you think of them!)" I don't really know what the creators were thinking, but an animated movie like this is not made by a small group of people. It had to then pass through Standards and Practices. That means that a LOT of people saw it and nobody questioned the messages that were being sent by making Daphne a caricature of morbid obesity and calling it Size 8. Nobody thought about the potential impact on their target audience, or the people buying the movie. “Fat Daphne” is drawn like she’s Violet Beauregarde from Willy Wonka, like she’s puffed up like a balloon. You know, like all of those horribly misshapen size-eight freaks out there in the real world, those social outcasts who are forced to live their lives like… normal women. Like professionals and artists and aunts and sisters and mothers WHO BUY THEIR CHILDREN SCOOBY DOO DVDs. [The creators] said “How can we make Daphne into something truly ugly? How can we make her the opposite of pretty?” And their answer was… let’s make her overweight. Let’s make her look like people’s friends and sisters and moms. Let’s make her look, not like a supermodel, but rather more like a normal girl you’d see on a normal street, and then let’s have her look in a mirror and RECOIL IN HORROR, just to make sure that all the kids watching at home know that being fat makes you into a monster. This is the sort of example of fat shaming that will get briefly discussed in small circles and then dismissed. The movie will prosper, circulate, and be purchased. It's not going to traumatize kids directly, or scare the pants off of them the way some of the monsters and villains might. No, it will have a much more passive impact. Kids and adults will see it and think little of it, because it's so in line with what we already believe: that fat is bad, and ugly is the same as being overweight, and it doesn't matter anyway as long as your boyfriend doesn't notice and still thinks you're pretty. They'll internalize it. They'll accept it. Because they already see it everywhere else, this movie just reinforces the message. And that's the most horrifyingly scary plot line of all.